As our federal government is cited for contempt of Parliament, it is notable that our provincial government also seems to be lacking in respect for the provincial legislature. “I expect this will be a recurring theme. My honourable colleague says it’s important to rein in public sector costs. I want to translate that so that Ontarians can better understand what he means by that. Those are indeed facts, according to both the National Energy Board Exports and Imports of Electricity reports, and statistics available from Ontario’s Independent Electricity System Operator (IESO). They are facts devoid of the context that would note $1.6 billion since 2006 is attached to 34,404,312MW hours, averaging $46.44/MWh since 2007, but only $35.01 in 2009, when a large customer in Ontario would have paid $62.17/MWh (page 30 here), or $27.16/MWh less in export markets than Ontario – and $41.44/MWh in 2010, when Ontarians paid $65.03/MWh – which is 57% more than foreigners paid/MWh. 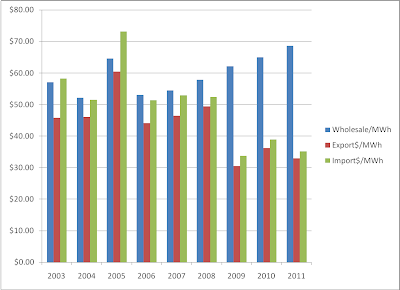 The IESO figures aren’t available for all of 2002 – but in 2003 the imports compute to around $600 million (close to $300 million was charged on exports), and the totals from 2006-2010 are $1.5 billion for 42.13TWh of net exports. The largest reason the data sets differ is interprovincial trade (not in the NEB data), which indicates Quebec is receiving Ontario exports cheaper than the US customers. Those are the facts, and the context for them, that answer Ontarians' questions. 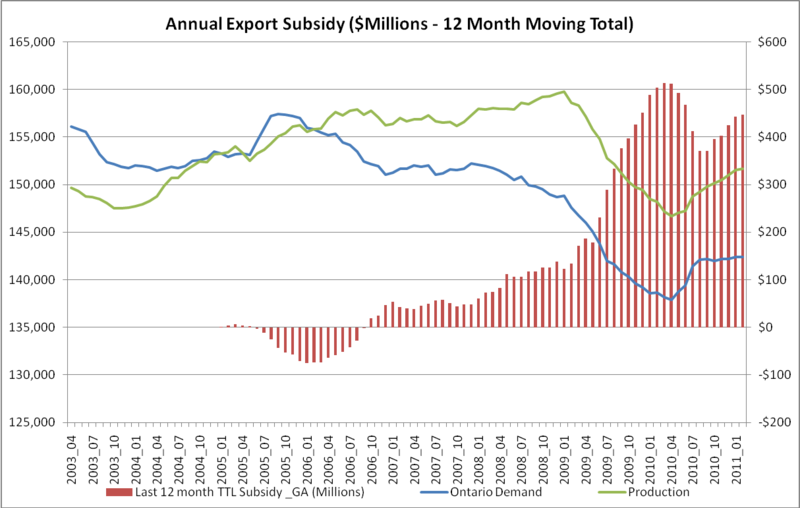 But the Premier also mixed in a lie with his statement – and 2002’s figures help illustrate the supply mix problem that is increasingly Ontario’s burden. Exports, in 2004, averaged $40/MWh, while imports were $71.45 (NEB data) – which is typical of Ontario’s large baseload capacity (we imported to match peak demands and exported in off-peak hours). 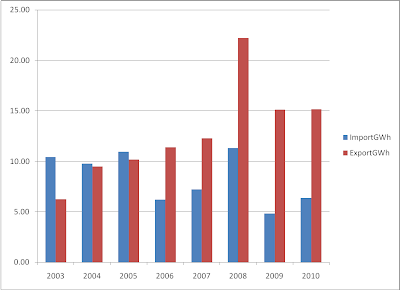 But the difference in total output between 2002 and 2010 is only 1 TWh, while nuclear output has increased 20 TWh due to 2 Bruce and 2 Pickering reactors that came back online by 2005 – projects initiated by the predecessors of a McGuinty government. The spike in exports is due to the supply mix we have and the declining demand we have experienced – the Premier’s government has been ineffectual at halting what was occurring despite it. Mr. McGuinty illustrates the confusion when politicians forget the opposition is there as representatives of people. He is likely avoiding an answer to avoid what it would mean to his LTEP hallucination and his FIT fantasies, but he is certainly demeaning debate. He is demonstrative of why Prime Minister Harper may not pay much of a price for his government being found in contempt of one of the country’s legislative bodies. 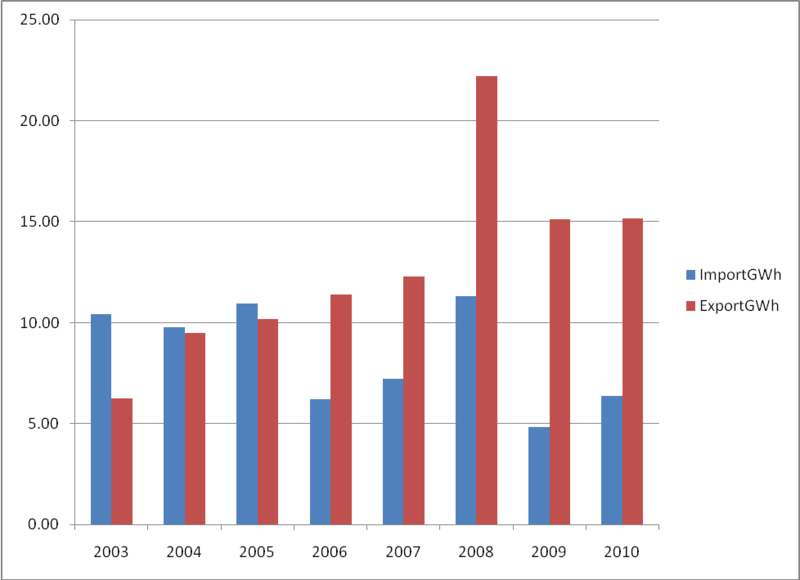 The data from the IESO starts in May 2002. 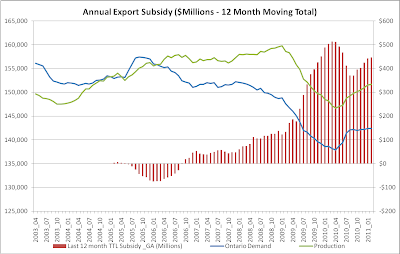 These charts are created, by me, from base data files available at the IESO site for imports/exports, HOEP pricing, and Global Adjustment figures. 2011 data on pricing is current as of March 1st. 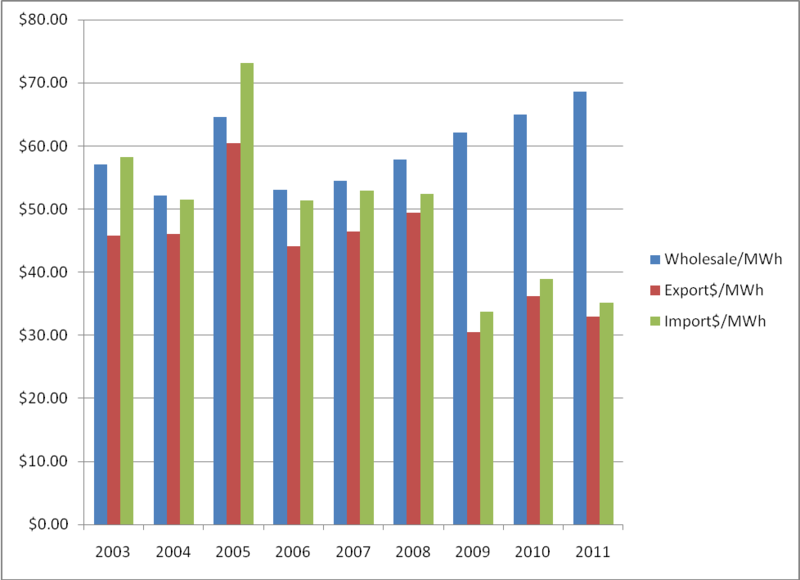 Imports have not changed to nearly the extent exports have - most notably in 2008, as demand began it's decline. Import/export pricing doesn't include the Global Adjustment (GA), which is the mechanism used directly (Wholesale market), or indirectly (RPP customers) to recover the cost of contracted supply (now over 92% of all supply). The Wholesale/MWh in this graph is the HOEP plus the GA. The contracts are driving up the price in Ontario - the low usage is driving the price down elsewhere. health risks like diabetes or high blood pressure. Many Thai sellers sell it on e - Bay and ecrater though, so if you're interested in trying some it shouldn't be too difficult to get. Although you cаn't go back to any songs, you can skip songs, mark them as ones you like or dislike, and browse the names, bands, and CD the song is on of all the songs that have played already. Many people will be happy with replaceable batteries for home use and occasional outings. This not only allows listeners to listen to their favorite MP3 files along with their SIRIUS radio; it also lets them digitally record their favorite radio songs for instant playback. Үou cаn also buy bundle dеals, which moѕt radio statiоns offеr, to deсrеase the overall ad coѕt. "All windows systems come with a internet sound mixer they all differ so you may need to review your manual or online sources to figure out how to enable or use it. Even if you have a good two way radio, it isn't bad to have some kind of receive only radio to get information on. Quality articles is the crucial to interest the visitors to go to see the site, that's what this web site is providing. link building are some of the factors using which Search Engine Optimization services are taken care of. NOW, I don't mean you should just put keyword spam in your footer. Search engines are getting smarter at detecting sites that are spamming keywords or made solely for the purpose of advertising. They make their strategy according to the audience their client is targeting. Lastly, make sure that you have a reliable work-at-home office. It focuses on networking and impeccable website maintenance. This helps auto dealership websites rank higher in the search engines results and get more traffic to the website. So, most move slowly when deciding on who becomes the company's SEO.
' Every page should be optimized with additional keywords. Immediately the word free caught my eye. These professionals follow ethical SEO strategy and effectively implement it that finally increases your website visibility. SEO defined. 4) Managing your online business. Keep in mind that Google doesn’t really like page rank manipulation, even if it’s internally on your site or externally by backlink spamming. The content must complement the theme of the website design. Yahoo style guide. I just noticed your web site: Blogger: Cold Air when I was searching reddit. com. It looks as though someone enjoyed your site so much they decided to bookmark it - good job! I know this is kinda off topic nevertheless I'd figured I'd ask. When you're happy with your game, why not share it with the world. Afterwards, joust your cash chips on the cash desk. This is your other tank in Warhammer online, special ability is buffs. What's Going down i am new to this, I stumbled upon this I have discovered It absolutely useful and it has helped me out loads. I'm hoping to give a contribution & help other users like its helped me. a 180 average without getting any strikes. You can also customize the car including retractable hanggliders. for the nice information you’ve gotten right here on this post. Thanks for sharing your thoughts on incrudisci.